CycleMap is an iOS application designed by Ratomic Lab to help cyclists around the world find bike lanes and routes worldwide, providing users with relevant information such as the type of lane, surface, and elevation, and also includes features such as bike share stations, stores, and off-line map usage. 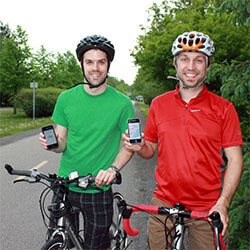 The idea for CycleMap was created by partner Olivier Carbonneau over two years ago when he decided something needed to be done in the cycling world to help cyclists find bike lanes more easily. In response, he developed an initial version of an iPhone app in his basement. When former colleague David Boudreault heard about Olivier’s idea, he instantly joined as partner with the aim of improving the product for sale. To improve the app, the team conducted hundreds of interviews with active cyclists to better understand what they wanted and where there were gaps in the market. Part of what they learned is that users wanted to learn and engage in real-time. In response, the CycleMap app now allows users to recommend lesser known paths, to comment on changes to routes, and to provide feedback. To date, CycleMap has been downloaded 40,000 times in over 75 countries. Being an entrepreneur lets me manage my time according to my own creative and inspiration moments. I can work anytime during the day – it doesn’t matter if I’m inspired at noon or midnight! Entrepreneurship is not the easiest way of life, but it is certainly the most fulfilling.